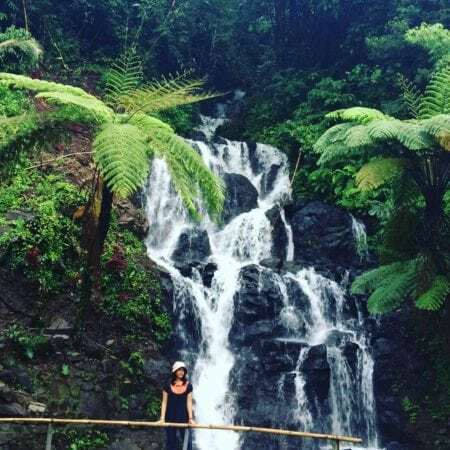 Though most of the waterfalls are cascading down from the high mountains in the north of Bali, this one is located conveniently close to Ubud, just 5 km to the south of Ubud’s city centre. Tegenungan is a perfect place to enjoy a hot day by the waterside. This 15-metre high waterfall is a great place to go swimming, it doesn’t take too much effort to get there and the entrance fee is only Rp. 15,000. Before heading down the stairs to get to the falls, there are lots of little souvenir shops and restaurants with a great view of the surroundings. Get a bottle of water and some snacks to enjoy down by the water. Where to eat: Once you are back up there, you can treat yourself to a delicious local meal. Check out Perantenan Restaurant, Waroeng Adji and Zest Ubud. They are all located near the waterfall and are very delicious too! The perfect day out! Getting there: The best way to get there is by renting a scooter or hiring a private driver. You can also take a taxi, but it is more expensive, and the drivers will usually charge a fee for waiting. It will take around 20 minutes from Ubud and 1 hour from Seminyak/Canggu. Tip: If you want to avoid the crowd, be there early. I reached there at about 6.15 am, and I noticed the crowd start coming in at around 8 am. There are also changing booths available, so you can change into your swimsuits and enjoy swimming in the cooling water. Be careful when going near to the waterfall as the current can be too strong. Also, the depth of the water is not safe for cliff jumping! Check out our villas in Ubud. The 35-metre high Aling Aling is found in the North of Bali, in the ‘Secret a Garden of Sambangan‘ to be precise. Not as secret as it was before, but still quite an amazing place where you can not only make a 10-metre jump down one of the 7 waterfalls but also slide down one of the falls. Great for all of you adrenaline seekers out there. I was a bit scared but I faced both challenges a couple years back and it is an unforgettable experience, captured on camera! 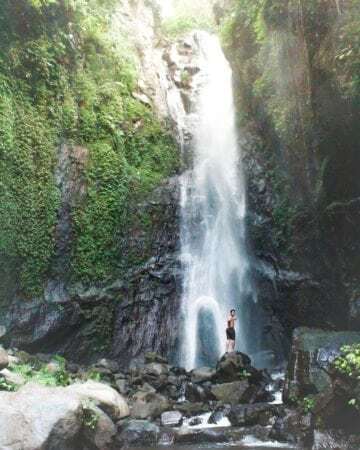 Aling Aling is the highest waterfall within the Secret Garden of Sambangan and the water rushing down into a 4-metre deep natural pool that is great for swimming. You can choose to do a long or a small trekking to see all or some of the waterfalls, spending a wonderful day out in nature! 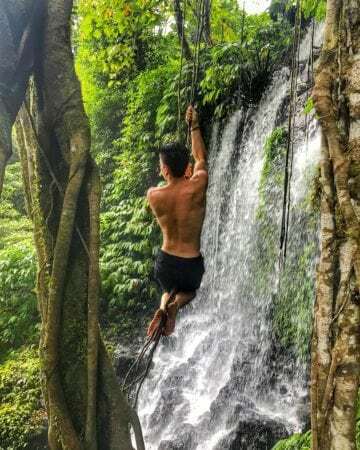 Where to eat: After trekking through this beautiful waterfall, fill your tummy at The Secret Valley Club, Krisna Adventure or The Damai Restaurant! Getting there: The best way to get there is by renting a scooter or hiring a private driver. 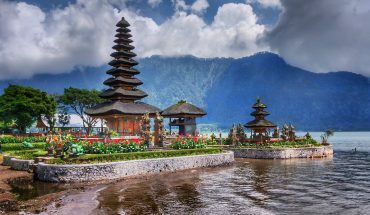 It takes about 2 hours from Ubud and 2.5 hours from Seminyak. Tip: You need to hire a guide to swim at the waterfall. There are two price options available: 1. Entrance to view the waterfall cost Rp. 10,000. No swimming is allowed and a fine of Rp. 250,000 will be charged if caught. 2. Trekking with a guide range from Rp. 125,000 to Rp. 375,000 per person based on the length of the trek. 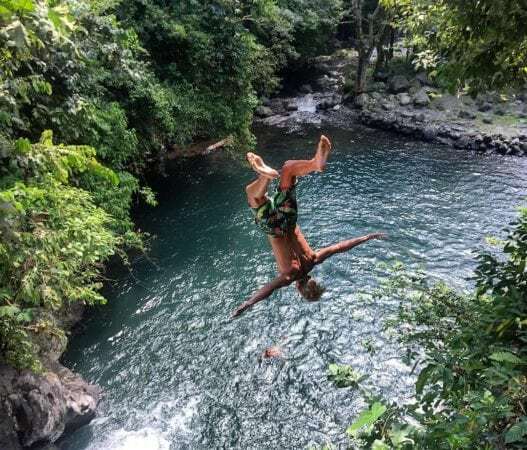 Swimming and cliff jumping are included, with a minimum of two people required for the trek. 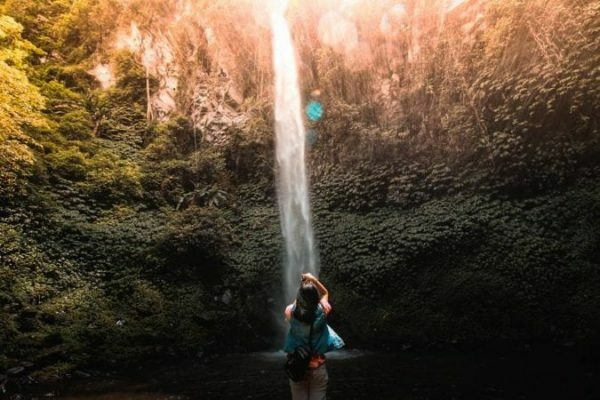 The 40-metre tall Git Git waterfall is one of the most famous, and most visited waterfalls of Bali, located in between Singaraja and Bedugul in North Bali. The waterfall splits into two while cascading down into a natural pool below, therefore Git Git is also knowns as ‘the twin falls’. 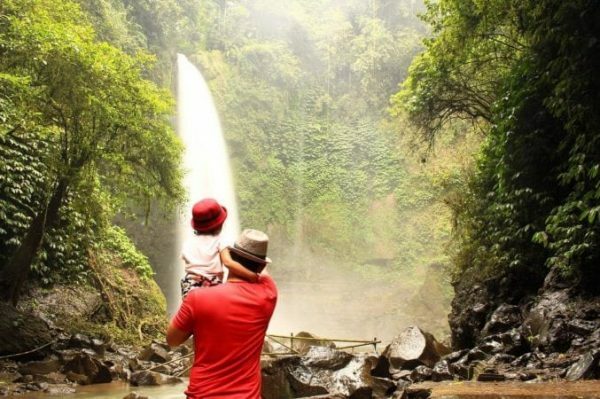 To get to the waterfall, you will wander down a scenic path in the nature of North Bali. You will pass souvenir stalls, clove and coffee trees. If you are up for a little hike, there are two more waterfalls to be explored close by, just a little 2 km jungle trek away. Where to eat: There are eateries near the entrance of Git Git waterfall, so you can fuel up before and after your hike! Getting there: It is nearer to get there from Lovina, the north of Bali. It takes about 40 minutes from Lovina and 2.5 hours from Seminyak. Tip: The entrance fee ranges from Rp. 10,000 to Rp. 20,000 and a little more if you opt for a guide. Some of the guides may overcharge, so be careful and bargain with them. 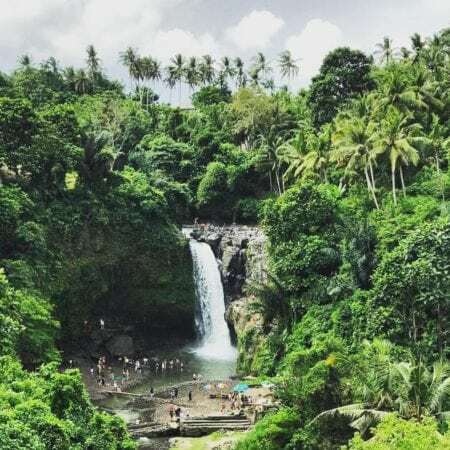 This stunning waterfall takes a bit more effort to access, passing many slippery roads, rocks, and steps in this lush green valley of North Bali, making it one of the least visited waterfalls of Bali. All the more reason to pack up and check this beauty out! Sekumpul Waterfall is actually not just 1 waterfall but it is a group of 7 falls. The highest one is 50 metres high and the sight from down below is truly magical! Where to eat: There are a few small eateries near the waterfall. However, you can also pack your own meals as the restaurants are pretty far away. Getting there: This is located in the North of Bali, and takes about 2.5 hours from Canggu and Seminyak. Parking is free, so you can go there by a scooter or hire a private driver. Tips: You need to go through steep steps and a small water stream to get to this waterfall, so it is good to prepare proper footwear to avoid injuries! Another waterfall of North Bali. Munduk is a beautiful waterfall that rushes down with a great force into a rocky pool below. You can really feel the force of nature when standing close to it, and you are most likely to spot a rainbow. Munduk is easy to reach from the main road by following a 300-metre pathway down the lush green valley. If you are up for a longer hike in nature, walk 1 km further down to see a second waterfall called Melanting. Where to eat: There are many cafes around Munduk for you to fuel up after your hike. Some cafes you should visit are Waterfall-Breeze Eco Cafe, Ngiring Ngewedang Restaurant & Bar and Warung Classic. They serve tasty food and offers beautiful view of the Munduk area! Getting there: It takes about 2 hours to get to the waterfall from Ubud / Seminyak. Parking fee cost Rp. 2000, so you can rent a scooter and ride there on your own. 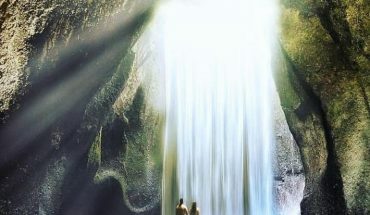 Tips: The entrance of the waterfall may not be obvious as the signpost is located at a corner. Do look out for the signage after you pass by Wanagiri Village. Also, the hike to the waterfall might involve sharing the road with villagers at Munduk Village. So look out for cars and bikes! 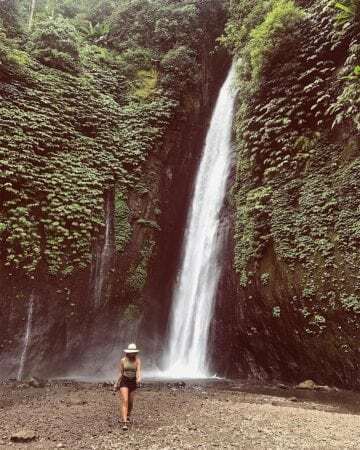 Singsing is another one of those falls that are not frequently visited by tourists, located up north again on the island of Bali, just a few kilometres west from Lovina. The ambiance is quiet and tranquil, making it a perfect nature escape. 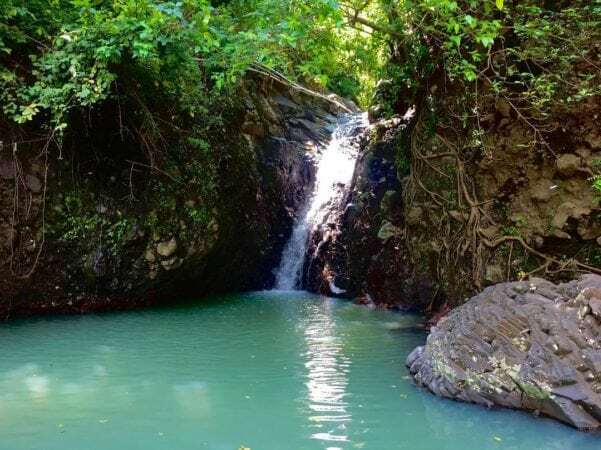 You will need a 20-minute hike through the lush green, peaceful surroundings get to the Singsing Waterfall. The best time to visit is in the rainy season from October to April if you don’t want to risk hiking up to a dried-up waterfall. Buy a bottle of water at the local warung at the entrance, and off you go. Let the sounds of nature be your guide. Where to eat: After getting out of the waterfall, you can head to Lovina for lunch. There are many famous restaurants such as Warung Ayu, Jasmine Kitchen and Cafe Greco. Getting there: It is just a 15 minutes car ride away from Lovina. 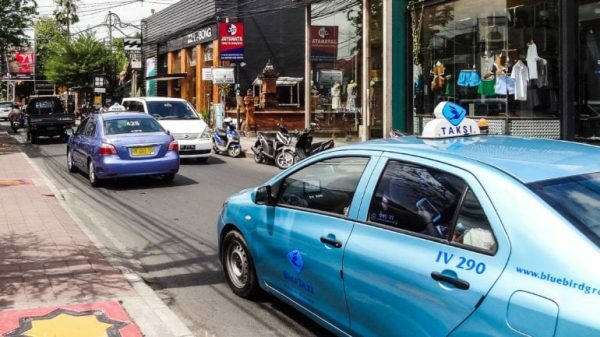 If you’re coming from Seminyak or Ubud, it will take about 2-3 hours. Tips: There are two waterfalls at Singsing Waterfall. The first one is easy to find, just a 5 minutes hike from the entrance. For the second one, is higher up and is much more difficult to get there. You can hire a guide to lead the way but be sure you agree on a price first! Yeah indeed, to this beauty! Yeh Mampeh actually translates to ‘flying water’ and you will know why once standing in this valley, gazing up at another impressive waterfall of the island, and feeling the water splash into your face and onto your body. 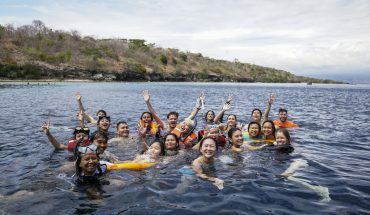 freshen up, take some great photos and also visit the nearby cave to make this day-trip complete. The location is a bit far out, allowing you and your friends to have this stunning waterfall site all for yourselves if you are lucky. You can find Yeh Mampeh Waterfall in between Singaraja and Kintamani. Where to eat: There is no eateries near Yeh Mampeh, but there are good restaurants just a short drive away. Check out Warung Pesisi Air Sanih and Air Sunny Restaurant. Getting there: It takes about 2.5-3 hours from Seminyak and Ubud, and 1.5 hours from Kintamani. Upon reaching the entrance, there is a short hike towards the waterfall. Since the ground is flat with stairs, it is pretty easy to hike up. Tips: It is safe to swim near the waterfall, but beware, there may be some locals bathing in the water! Jembong Waterfall is another enchanting waterfall rarely visited due to its location – close to the frequently visited Git Git waterfalls. Being overshadowed by its famous sister, Jembong waterfall is still untouched and surrounded by breathtaking nature. A great place to find peace of mind, allowing nature to calm your mind, body, and soul. You can take photos that appear to come straight out of a fairytale book, so beautiful! Getting there: Similar to Git Git Waterfall, it is a 2.5 hours ride from Seminyak. Tips: It is easy to find and you do not need a guide to get there. NungNung waterfall is located in the central highlands of Bali, near Bedugul. 509 steps will take you to the bottom of this impressive waterfall, and on the way down you are treated to magnificent views of rice paddies. NungNung is a quiet place where nature rules. The air is fresh, the surroundings are untouched and trust me when I say that you will feel quite small when looking up at this 70-metre waterfall. Bring your bathers, cause if the sun is out, you might want to swim in the cool refreshing natural pool. Where to eat: After the hike, you can check out Puhu Restaurant and Lounge or Wilis Restaurant by Senetan. Getting there: It takes about 2 hours to get there from Seminyak. It is the best to rent a bike and ride to this waterfall. Tips: Steep steps are leading to the waterfall so that can get a little tiring. However, you will be rewarded by the stunning view of the waterfall. It is also less touristy, so you can get as many insta-worthy pictures as you like! Always wanted to swim in a natural pool, surrounded by multiple cascading waterfalls? This is your chance! Not easy to reach but so much worth the effort! The Banyumala Twin Waterfalls are simply breathtakingly beautiful. You may feel like having found an enchanted forest where you can relax and swim the whole day long! 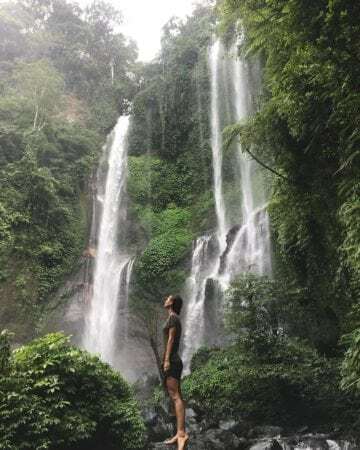 This waterfall is located close to Lake Buyan but to actually get to the falls, you may have to get a guide to show you the way. Where to eat: Some good restaurants and cafes nearby are Waterfall Breeze Eco Cafe and Terrasse du Lac Tamblingan Sari. Getting there: It takes about 2-2.5 hours to get there from Seminyak/Ubud. It is a stunning waterfall but it’s not easy to get there. You can hire a private driver as they may be more familiar with the area. Tips: The hike is steep, wet and slippery. So prepare proper footwear and be prepared for a little difficulty! Blemantung is located in the rural, fertile Tabanan regency of Bali, surrounded by rainforest and coffee plantations. This waterfall cascades down 50 metres down from the high cliffs above and you can swim in the crystal clear water below. It takes an 800-metre trekking in nature down to get to the bottom of this waterfall. Take in the serene ambience of this place, see the almost magical colours, breathe in the fresh air and pay attention to the subtle scent of coffee in the air. You will love it here! Getting there: It is 2.5 hours away from Seminyak. You have to walk quite a distance before getting to the waterfall. But the route is beautiful and serene, you’ll enjoy it! Tips: The road can get muddy when it rains. So prepare proper footwear if you are planning to visit during the wet season! 15 of Seminyak’s Best Restaurants That Will Keep You Coming Back for More!